When you're munching on French fries or potato chips, you're probably not thinking about the potato psyllid. You should especially be thinking about the zebra chip. No, it's not a newly marketed potato chip or computer chip. Basically, it's a disease of potatoes transmitted by the potato psyllid. It's caused by the bacterium Candidatus Liberibacter solanacearum. The disease, first identified in 1994 near Saltillo, Mexico, causes major economic damage and is spreading throughout much of the United States, including Arizona, California, Colorado, Idaho, Oregon, Kansas, Nebraska and New Mexico. "When fried, potato tubers from infected plants develop unsightly black lines resembling the stripes of zebras that render the chips unsellable," according to Wikipedia. "Additionally, striped sections of chips frequently burn and caramelize, resulting in a bitter flavor. No health risks have been connected with consumption of infected potato chips." The Yakima (Wash.) Herald spotlighted zebra chip in a May 2015 news story featuring Rodney Cooper, a research entomologist with the USDA's Agricultural Research Service laboratory in Wapato, Wash., and Jenita Thinakaran, then a postdoctoral research associate at the laboratory. And now, Thinakaran, a UC Davis postdoctoral researcher based at the Shafter (Calif.) Agricultural Research Station, will present a UC Davis Department of Entomology and Nematology seminar on "A Systems Approach to Managing Potato Psyllid in Relation to Its Alternate Hosts" at 4:10 p.m., Wednesday, Jan. 23 in 122 Briggs Hall. In his news story, Yakima-Herald reporter Ross Courtney described the disease as "a brown, streaky condition inside the flesh of the tubers most noticeable after they've been sliced and fried, such as for potato chips." Researchers don't believe the infected potatoes pose any health threat, but farmers know customers won't buy them, Courtney related. "Research is underway, but the stakes could be high. The disease shows up in several countries around the world. In New Zealand, zebra chip cost growers $22.5 million in 2010 and 2011, according to a 2012 paper by Joseph Munyaneza, a Wapato laboratory colleague of the two researchers. In northern Mexico, zebra chip has been known to wipe out 60 percent of the crop, forcing farmers to abandon entire fields. Tomato and pepper farmers throughout the world have noticed crop losses due to the same bacteria." What about potato psyllids in California? "Psyllids used to be an occasional problem in California in certain years when they would migrate into the state from Mexico," according to the UC Statewide Integrated Pest Management Program (UC IPM) website. "In recent years, however, a more invasive form of the species has been found in California that has the ability to overwinter in parts of southern California. Potato psyllid now occurs on a yearly basis in these areas and has become a chronic problem." UC IPM describes the pest as looking like a "small cicada, about 0.08 inch (2 mm) long" and related to aphids and leafhoppers. "The adult has clear wings that rest rooflike over the body," UC IPM says. "Although predominantly black, the potato psyllid does possess white markings. The first abdominal segment shows a broad white band, the last segment has an inverted white 'V.' Psyllids jump quite readily when disturbed." "The football-shaped eggs are extremely small, slightly larger than leaf hairs, and on a short stalk. They are usually on the underside of the leaf along the edge and in the upper plant canopy. A 10X hand lens is required to see them." Thinakaran, who holds a doctorate in horticulture from Texas A&M University, College Station, completed her dissertation in 2014 on "Evaluation of Potato Psyllid, Bactericera cockerelli (suic) (Hemiptera: Triozidae), Host Preferences, Adaptation, Behavior and Transmission of 'Candidatus Liberibacter solanacearum' among Wild and Cultivated Solanaceous Hosts in the Lower Rio Grande Valley of Texas." She studied with major professors Don Henne and Elizabeth Pierson. 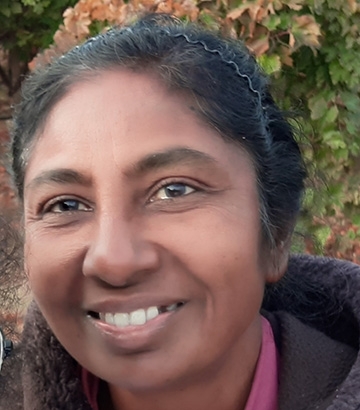 At her UC Davis seminar, Thinakaran will discuss the economic damage of the pest, its hosts, and her ongoing research. "The research I will be presenting relates to my previous work at Texas A&M and USDA-ARS. Dr. Don Henne (presently with Lakehead University, Canada), Drs. Joseph Munyaneza, Rodney Cooper and David Horton with USDA-ARS and Dr. Andy Jensen (Northwest Potato Research Consortium)," she relates. The potato psyllid "causes economic damage to potato crops throughout the major potato growing regions along the Rocky mountain corridor," she writes in her abstract. "Settling and oviposition preferences were studied on its wild and cultivated solanaceous hosts, including potato, tomato, pepper, eggplant, and silverleaf nightshade (SLN). Silverleaf nightshade is a common weed in the Lower Rio Grande Valley of Texas and a host for both the potato psyllid and Lso pathogen. Results of settling and oviposition studies indicated that potato psyllid preferred potato and tomato equally for settling and oviposition, but settled on pepper, eggplant, and SLN. Transmission studies determined that potato psyllid can acquire Lso within a 2-week acquisition period on Lso-infected SLN and can serve as a reservoir for Lso, providing a source of inoculum for potato psyllid adults colonizing potato during the following season. Under laboratory conditions, potato psyllid preferred larger host plants, regardless of the species tested. Lone plants attracted the most psyllids and can be used as sentinel plants to monitor potato psyllid activity. 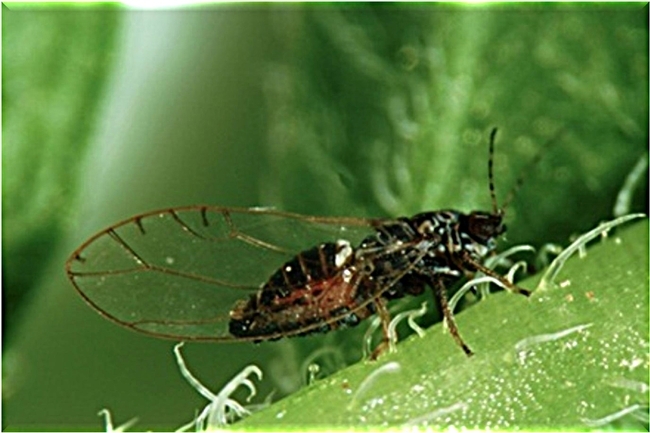 When cultivated crops are not available, potato psyllid often occurs on non-crop hosts. "To test the hypothesis that potato psyllid are year-round residents, not migrants from more southern regions, monitoring of Lycium spp. was undertaken in the Pacific Northwest (PNW) throughout the year from June 2014 to June 2016," Thinakaran relates. "Lycium in the PNW occurs as two different species and collectively referred as matrimony vine and Goji berry. Not knowing the source of psyllids makes it difficult to predict when and in what fields the psyllids will arrive. Our monitoring results provide circumstantial evidence that matrimony vine is a source of potato psyllid arriving in potato fields of the PNW. All 14 stands of matrimony vine that were examined in Washington, Idaho and Oregon were found to be infested with potato psyllid suggesting that association of potato psyllid with matrimony vine in the PNW is common and widespread and that matrimony vine is also a host when the potato crop is seasonally not available." Thinakaran points out that "psyllids began showing up in potato fields at virtually the same time that they were disappearing from matrimony vine, coinciding with the onset of summer defoliation. Indeed, psyllid numbers on matrimony vine in the spring may be found to accurately predict the numbers of psyllids that eventually migrate into potato. Ongoing research in 2018 and beyond will reveal whether matrimony vine can be used by growers as an early warning system to predict the risk of potato psyllids colonizing potato fields." Thinakaran received three degrees in India: her bachelor of science degree in agriculture and her master's degree in agricultural entomology, both from TamilNadu Agricultural University in Coimbatore, and her master of business administration (MBA) in operations management from Indira Gandhi National Open University in New Delhi. She owned and operated an agro business in Coimbatore until her career took her to TamilNadu as a senior research fellow and then to Texas A&M for her doctoral studies. Maybe for ecology, you can look at controlling the bacteria spreading since that is causing the problem.